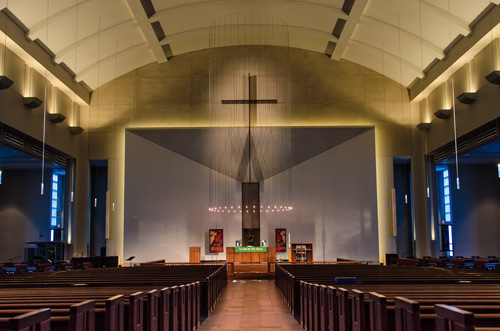 With its new steerable Meyer Sound CAL™ column array loudspeakers, Trinity Lutheran Church in Spring, Tex. has discovered a whole new level of speech and music clarity never heard before in its highly reverberant 1,400-seat sanctuary. Blending harmoniously with the architecture, two CAL 96 loudspeakers comprise the main front system in a split-beam configuration. Two CAL 32 loudspeakers are steered with a 10-degree down tilt for rear delay, while an additional CAL 32 loudspeaker provides choir loft delay. Two X-800C subwoofers extend low-frequency coverage for music programs. A Galileo® loudspeaker management system with one Galileo 616 processor provides system drive and processing. The system, along with a new Soundcraft Vi3000 digital mixing console, was supplied and installed by Houston-based Covenant Communications.